Canned pumpkin purée is perfectly fine, but there’s something about the taste of fresh, homemade pumpkin purée. It’s more pumpkin-ey, which makes anything made with it taste that much better, and richer.October is almost over—can you believe it? I can’t. I’ve never had a year go by so quickly. Just like in last week’s Friday Bits blog on roasting squash and maple roasted butternut squash, we’re right in the middle of squash and pumpkin season. 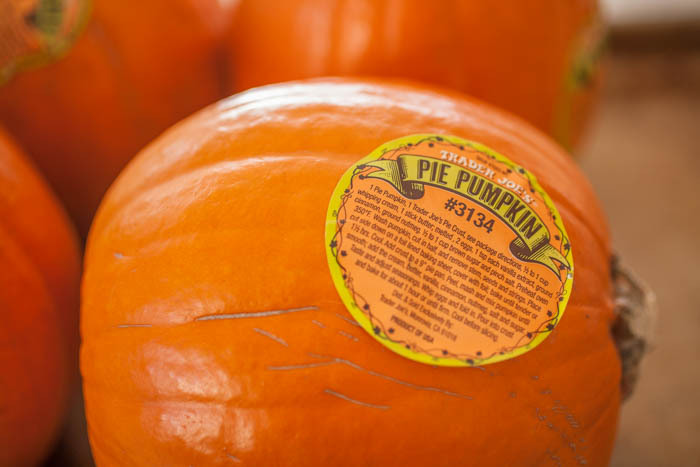 There’s pumpkin absolutely everywhere (have you read Trader Joe’s “Frequent Flyer”? ), including pies, muffins, cakes, and cookies. What goes in to all of those baked good? It is a bit more work than opening a can (and there’s absolutely nothing wrong with that! 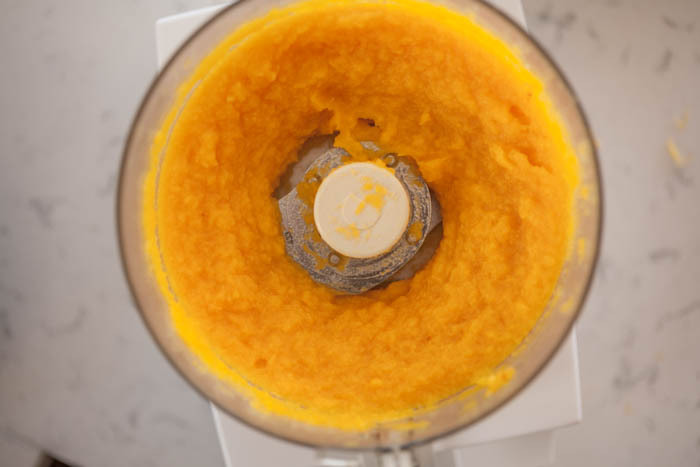 ), but making homemade pumpkin purée isn’t too much work so give it a try! It’s always kind of fun baking with pumpkin purée you’ve made from scratch! 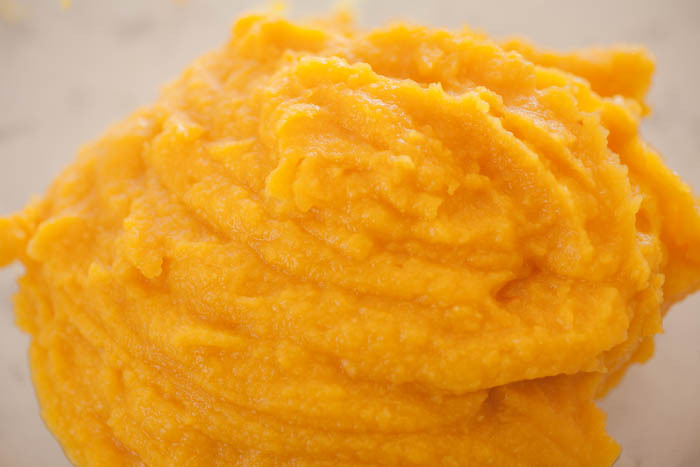 You can make pumpkin purée with just about any kind of pumpkin, and even other kinds of squash. I usually make my pumpkin purée with small sugar pumpkins, also known as pie pumpkins. 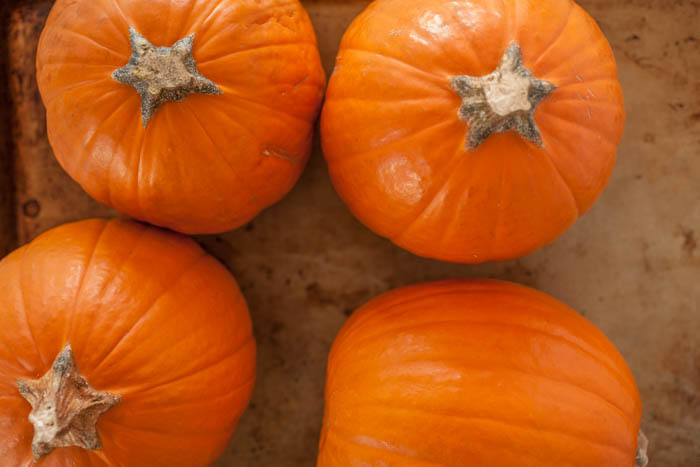 They are aptly named—they’re slightly sweeter than other types of pumpkin, plus they’re just easier to work with because they’re small (anything that makes life in the kitchen easier…). 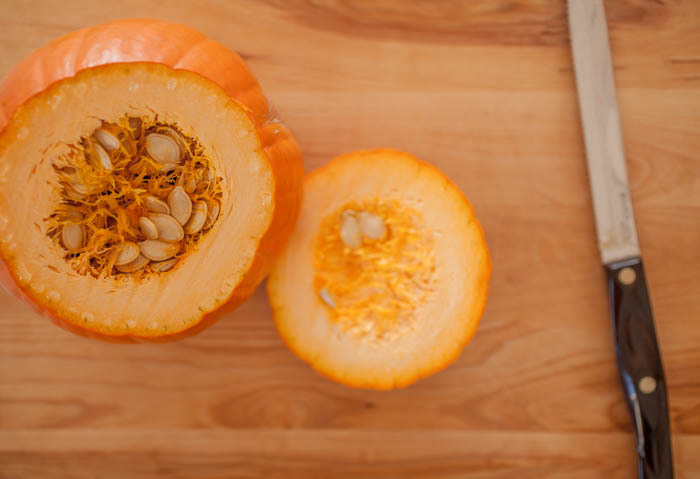 I’ve seen quite a few tutorials that recommend that you not only cut the pumpkin before you bake it, but you also scoop out all of the seeds and strings. I hate gutting pumpkins. Hate it to the point that I rarely wanted to carve pumpkins when I was little. It’s just too sticky and messy and the threads don’t come out evenly, which, as a perfectionist, drives me nuts. Plus, it just takes forever (okay, I could be exaggerating a little…). 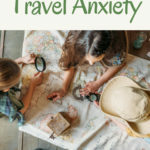 Now, you may not have this problem. You may also not be lazy and always looking for shortcuts in the kitchen like me. 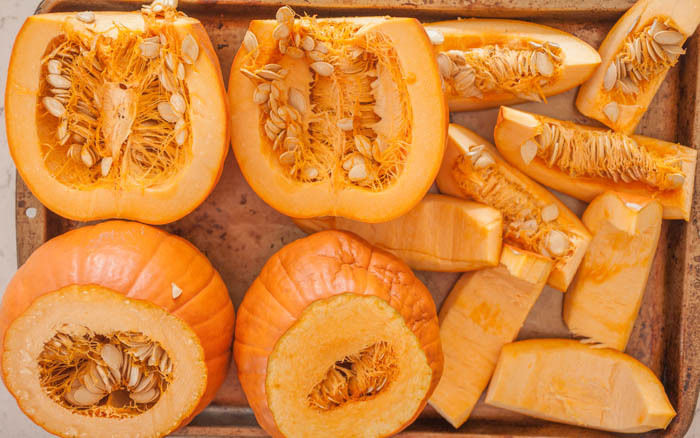 If you are, however, it’s perfectly acceptable to either 1) cut up the pumpkin but refuse to remove the seeds, or 2) just cut off the top of the pumpkin and roast the entire thing, just like I recommended with roasting squash. Cut off the top and stick the rest in the oven. Really simple. This leads to almost steaming the pumpkin inside—the flesh was softer for this pumpkin than the others. That fact did make it a tad more difficult to cut open/de-seed, but it’s nothing that bad and it’s completely worth it to save the extra time. Roasting half a pumpkin is probably my way to go. There’s not too much hacking away to begin with, but the pieces still get nicely roasted. 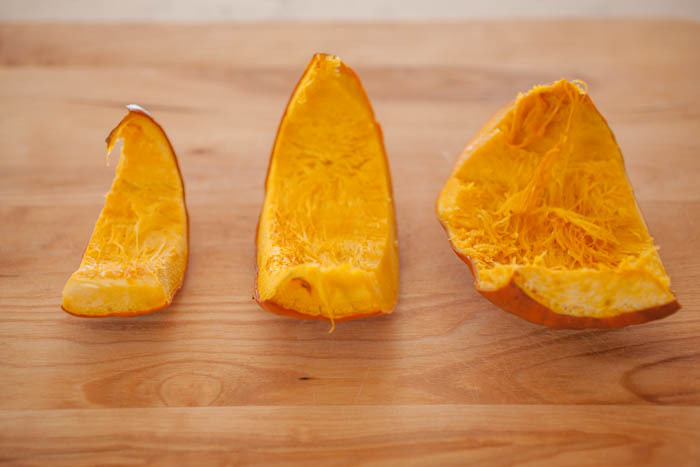 Once cooked, you can cut each half in half and have enough pumpkin your hand to easily cut out the seeds (see below), but not too much. 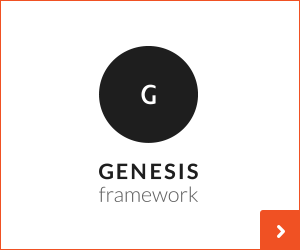 This requires the most hacking/work. 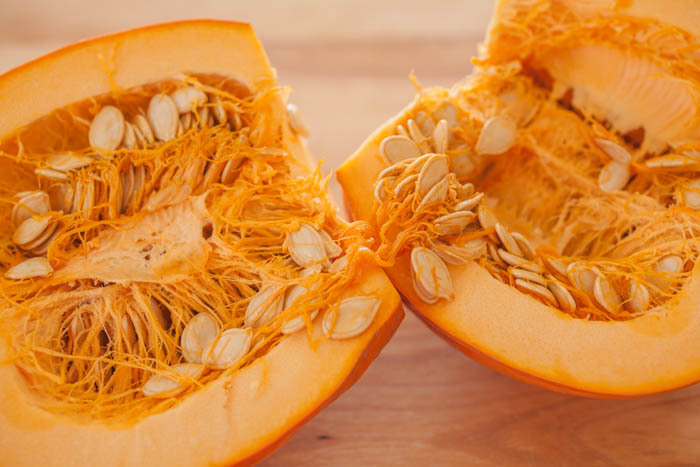 The pumpkin roasts up just fine, but does shrivel a little bit, which leaves less pumpkin to hold when you’re trying to cut the seeds out. Plus, there are more pieces to work with than the quartered pumpkin, which takes more time. I love just being able to stick the pumpkin into the oven without scraping and scraping. The only time it was easier for me to cut the pumpkin seeds out before it was baked was when the pumpkin was cut into pieces. The pieces get a little too small to cut them easily when they’re softer, but when the flesh is still firm, it’s just like cutting a watermelon. I actually prefer a knife over a spoon when cutting pumpkin. It’s sharper, making it much easier to make one smooth job of cutting out the seeds and strings. Simply cut the seeds and strings out like you’re cutting seeds from a watermelon. This is so much faster than using a spoon to scrape. Cutting > scraping = knife > spoon. All-in-all, my experiment showed me that it’s perfectly okay to roast a pumpkin without taking all the seeds out and hacking away at it if you don’t want to. After that, the way you decide to roast your pumpkin is completely up to you. Neither has a huge advantage over the other. From right to left, we have: pumpkin baked in pieces (with seeds), pumpkin baked in half, and pumpkin baked whole. The only reason I can think of to cut the seeds out of the pumpkin first is if you want to roast the seeds. I also cut the pumpkins using both a serrated blade and a regular blade. I can’t say that either made too much of a difference. The serrated blade made it a tad bit easier to cut the top off, but the straight blade was a little better for cutting the pumpkin into pieces and then cutting the seeds and strings out, especially once the pumpkin was cooked. It really depends on how much time you have and how much time you want to spend. 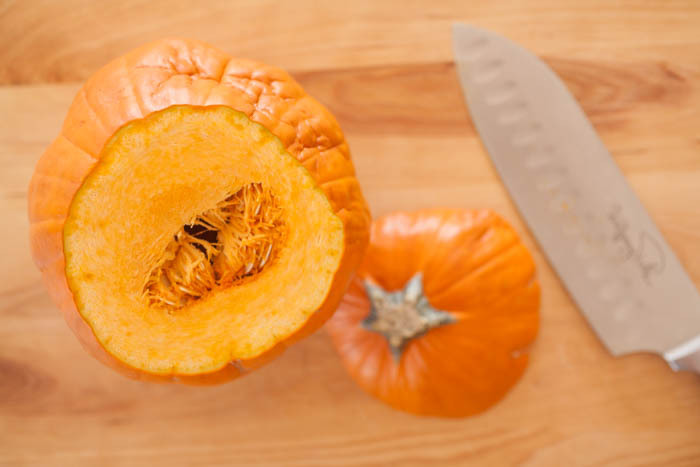 If you cut the pumpkin up, you do get a deeper, richer pumpkin flavor because you’ll be roasting the flesh. However, there’s really not a lot of difference. Just experiment and see what you prefer! The next step is optional: some people prefer to take out the seeds and strings before they roast, especially if they’re going to roast the seeds separately. Place the pumpkin on a sheet pan lined with foil or Silpat, then stick them in the oven until the pumpkins are soft, shiny, and slightly wrinkly, or about 45 minutes. You’ll be able to easily stick a fork through into the flesh. 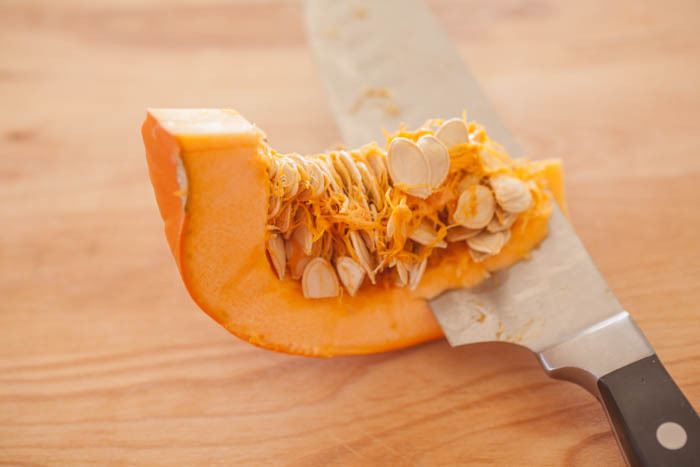 Let the pumpkins cool, then cut it open (if not already cut into pieces) and scoop the seeds if you haven’t already. 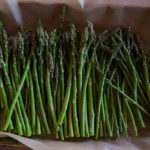 Then scrape the flesh from the skin with a knife or spoon. 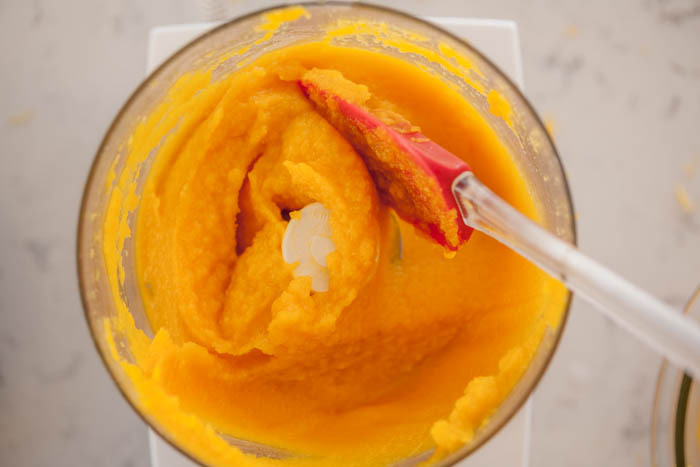 The idea is to get the pumpkin as smooth as possible, like this: And, pumpkin puree freezes perfectly! 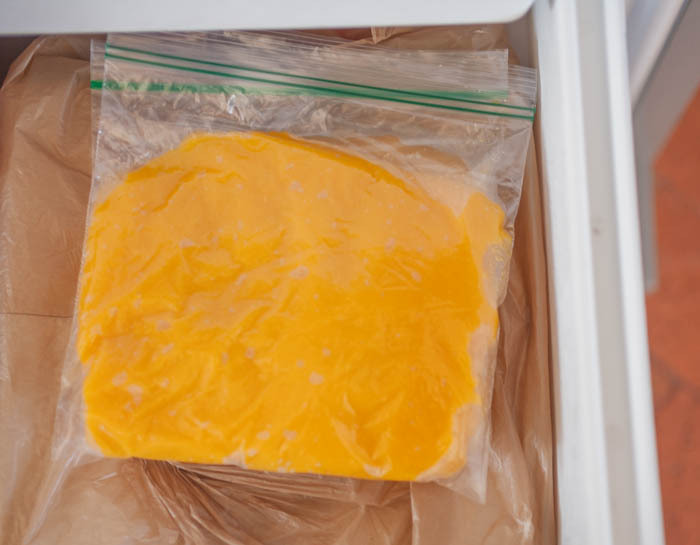 Just scoop it into a zip bag and put in the freezer. 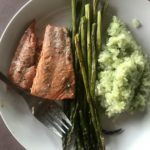 I usually freeze it in small portions to use for baking. I freeze them flat so they store more easily. So that’s it! 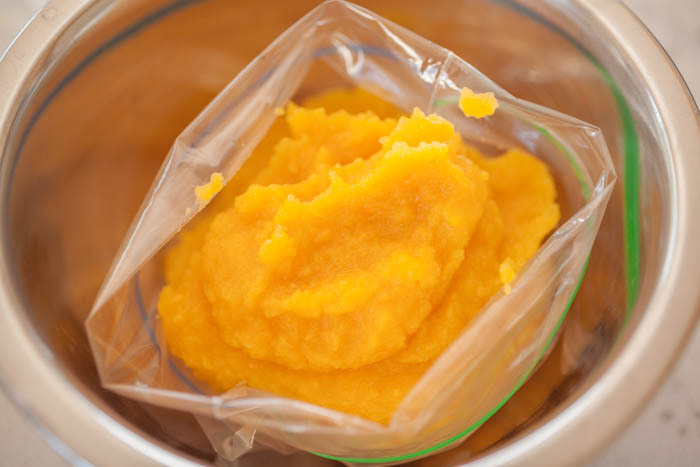 Pumpkin purée you can use in anything. There it is, all ready for your holiday baking and enjoyment.